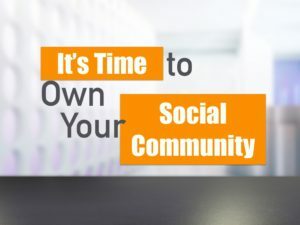 You can spend your time and money on leased social communities like Facebook, Twitter, Linkedin, Instagram, or Pinterest…and many companies are doing just that. But, those communities do not offer a reliable way to communicate with your customers and fans WHEN and HOW you want to. That’s why smart companies are swinging the pendulum back to the “original” social media…back to owned social communities. More control, more engagement, more reliability. That’s the owned social community dynamic. Maybe it’s time you looked into this option for your own social media program? This SlideShare is based on a post from Jay Baer on the Convince & Convert blog.